This is where I admit to thoughtlessly not backing-up my vacation photos. I transferred all 130 or so photos to my computer, deleted said photos from my camera, called it a day and wouldn't you know, next day my computer refused to boot. I took it in for repairs, and oh, yea, my computer runs better than ever now, but my hard drive was wiped in the process. Hence, I've got maybe six photos, all food-related, that I'd pretty immediately uploaded to Facebook at Nick's request and for that, I thank you, Nick. I've at least got six photos chronicling my trip half-way around the world. That said, I was pretty seriously and immediately wowed. I vocally dreaded the 12+ hour flight, but was awed when we took the Polar Route. We flew straight up into Canada, across the vast and frozen Hudson Bay, toward the North Pole, down through the Aleutian Islands and over Siberia. We flew over ice, glaciers and frozen mountains -- nothing else -- for close to ten hours. I'd show you a picture, if I had one. Once in Tokyo, my friend, Aika's family was kind enough to let us stay at a family member's empty apartment a block or so from the Buddhist temple the family keep. So, yes, Nick and I had our own apartment, so to speak, for eight days in Minato-ku, the heart of the city. This was indeed a charmed stay in an amazing place. Staying on the seventh floor we had sweeping views on one side toward the bay -- we could see the Rainbow Bridge -- and on the other, a glittering cityscape. Thank you so much, Aika's family! And yes, the apartment had a toilet complete with bidet features and heated seat, but most impressive was the bathing room with a deep, square tub and bunny soft water that didn't flow from a spigot, but the side of the tub: warm, warm and the warmest at the end -- perfect. Did I mention that you could pre-heat the bathing room in advance? Which was a super-nice feature, because Tokyo's cold in January! It's Bay Area cold, with a deceptively mild, but bone-chilling temperature. So, what did we do in Tokyo besides hang out in said apartment, bathing and watching late-night network programs? And this is where I mention late-night TV! There's a station that plays a lullaby accompanied by a montage a kitty cats going to sleep each night at midnight -- Really, Tokyo?! <3 That said, we ate. We ate at izakayas, had conveyer-belt sushi, we ate stand-up ramen soups ordered from a machine, but prepared by a skilled human, we made our own okonomiyaki... but one night, this one night, we were treated to a phenomenal dinner by Aika's mom. Knowing that Nick and I are vegetarian, Aika's mom said, "Oh, I know where we'll go!" We had no idea what we were in for! Aika walked us through the grounds of Zojoji Temple underneath the Tokyo Tower -- a spectacle unto itself, and then she walked us down a garden path to Tokyo Shiba Toufuya Ukai. Holy, holy! First, what an amazing place. We romped through a traditional Japanese garden so well-planned that from one window we had a view that's said to replicate that of a wood block classic -- and that's just one window. We were set in a private room and served eight courses of hand-crafted tofu in all its stages of development; all served with enough sake samplings to make your head spin and by a server who did nothing less than serve us while on her knees and bow to the ground before leaving the room. An especially memorable course was a block of hand-crafted silken tofu served in warm soy milk and topped with a sprinkle of kombu. Again, holy, holy, this restaurant! Holy, holy, Aika's mom! Really, our trip was made of top experiences like that. We wandered around all of the famous neighborhoods, saw drunken salary men, Harjuku girls, sumo wrestlers, peeped a maid cafe in Akihabara and bonded with drunken anime dudes over Thunder Cats in a tiny Golden Gai bar. We even spent a day outside of the city and traveled to Kamakura on the Pacific coast where we visited rustic, wooded temples and paid homage to a 140 foot-tall bronze Buddah and on the way home stopped in Yokohoma's China Town for dinner. As far as neihborhoods go, I really enjoyed Shinjuku after dark. In particular I liked an alley called "Memory Lane" filled with ramshackle yakitori koints, an izakaya or two and a cool bar called Albatross, where drinks are passed upstairs through a hole in the ceiling. Also in Shinjuku, I enjoyed the Golden Gai. It's a sort of post-war, black-market-looking stretch of alleys filled with hundreds of pocket-sized bars, hidden among neon makes-Times Square-look-like-peanuts Shinjuku. Bar-hopping in Golden Gai is like a guessing game. You spot a cool looking sign, open the door to a closet-sized room packed with five or six patrons until you found the spot where you could squeeze in. Then there were the times where Nick and I, not knowing what we were doing, stumbled into situations. A highlight being the night we spotted the Tokyo Tower from the metro car we were riding and spontaneously got off. We walked all of the way to the Tower, because we remembered that there's jazz in the observation deck lounge every Thursday night. For the cost of admission, which was cheaper than the admission to any dive bar in Tokyo (Serious! Cover charges are outrageous), we took in awesome night-time views of the city and listened to live music. Another odd highlight was stumbling across a German Beer Hall in Ginza complete with a lederhosen-wearing, German language-singing, elderly Japanese oom-pah band! I went through Nick's photos the other day, bemoaning my lost vacation snapshots the whole time. I guess I've now got an extra reason to return to Japan -- in addition to the lovely countryside, people and culture -- to photograph the heck out of the lovely countryside, lovely people and lovely culture! I look forward to my next visit and promise to share those photos with you! I've never known much about Trish Keenan. I didn't even know her age until it was printed today (she was 42). That said, the music she created has greatly enhanced much of my adult life. I was introduced to Broadcast when Nick lamented his lost copy of Work and Non Work. I happened to be thumbing through a record shop shortly thereafter and came across it. I gave it to him for my birthday. In the interim, I'd slipped the record on to my turntable and was frightened by its eeriness and intensity -- that said, it's the record I most wanted to hear tonight. Shortly thereafter, we had the opportunity to see Broadcast perform. It was both an intimate and a mind-blowing experience; I became a devoted fan then and there. In the years that followed I've been excited by the possibility of each new recording and live performance. I took for granted that I would have years to enjoy what Trish Keenan created and have learned today that I will miss a person I have never met. This is the one that tripped me up that first time I listened to this record, but there are so many beautiful tracks, you should check them ALL out. Really, do yourself a favor. 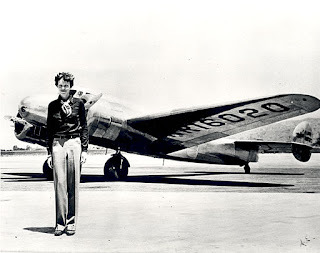 Today's news that remains found on an uninhabited Pacific atoll are believed to be those of Amelia Earhart has inspired me to make a reappearance myself. It's been too long, maybe not 73 years too long, but long. Amelia Earhart standing in front of the Lockheed Electra in which she disappeared in July 1937. How many times can you say, "Who dat!" in one blog post? Between the Saints playing in their first Super Bowl tomorrow and Mardi Gras starting in a week and a half, I suppose my venturing down to the New Orleans this past weekend was somewhat serendipitous. That said, while partaking in the sensory overload that is New Orleans, it was nearly impossible to forget either the Saints or Mardi Gras, for even a moment. We arrived in town Saturday evening and found ourselves staying right along the Krewe du Vieux parade route. Since our cab (provided by the Praise God Cab Company, no less) couldn't take us any further, we followed the mule-pulled floats and marching bands down Chartres to drop off our stuff and then head back to the revelry. The Krewe du Vieux, from what I understand, is a locally-grown pre-Mardi Gras tradition. This year's theme, Fired Up!, showcased some rather, ahem, adult-themed floats and others poking fun at local politicians like Ray Nagin and Bobby Jindal, all this to the sound of brass bands and repeated crowd chants of, "Who dat! Who dat say dey gonna beat dem Saints!" I think this is the closest I'd ever like to come to Mardi Gras; the revelers were just fired up enough. That said, with the exception of Sunday's (men in) Dress(es) Parade to celebrate the Saints Super Bowl debut, and more, "Who Dat! "-ing, I spent the next few days in relative quiet. I strolled the streets of the Marigny and the French Quarter, wandered over to the Mississippi River, took the ferry to Algiers, rode the St. Charles Avenue streetcar up to the Garden District and toured the "cities of the dead." Being vegetarian, I felt somewhat left out of the city's fine food tradition, but not completely. A highlight being our Creole-style breakfast of Eggs Sardou and Cala Cakes (fried rice cakes filled with pecans and covered in maple syrup) at the Old Coffee Pot. The beautiful, rose-detailed chandelier and salon-like atmosphere hearkened back to another era, but was somewhat incongruous with the music blasting from the kitchen and the wait staff's intermittent chants of, you've got it, "Who Dat!" Dat said, this spot had character and definite charm. The clincher being a waitress stopping to serenade a little boy with the most soulful rendition of Happy Birthday that I've ever heard. So, we wandered and ate. Stopping to scarf-down vegetarian muffulata and eat our fill of beignet buried in powdered sugar. We wandered and drank. I know a lot of people visit New Orleans intending to drink mind-bending, punchy Hurricanes or Cyclones, but that's just silly in a city with such a deep appreciation of classic cocktails. If I only had one drink in New Orleans, I'd intended it to be the first cocktail ever, Sazerac. When all was done, I had far more than one drink in New Orleans, but two of them were Sazerac. I sipped one at Herme's Bar at Antoine's, the other at the Roosevelt Hotel's Sazerac Bar and both were utterly intoxicating, figuratively and literally. In the end, there was jazz, jazz and more jazz, I piqued my sense of smell at a centuries-old perfumery and even teased my sixth sense by leaving an offering at the grave of New Orlean's most famous voodoo queen, Marie Laveau. I spent a chock-full three days and sadly, wasn't able to check every item off my to-do list, but that's probably for the best. If nothing else, I've got a reason to return and see if people still, "Who Dat!" and parade around in beads on a random Thursday in April. I've posted more photos here. As a new year gift, this is where I share with you an old-style, super-regional Swedish dish - Kroppkaka! I'm kind of obsessed with Kroppkaka. Mostly because I've never met another person of Swedish ancestry who's heard of it; I'll describe these pork-filled potato dumplings and get, "Oh, Palt," to which I answer, "No, Kroppkaka." After a little Googling, I've learned that Kroppkakor are mostly eaten in the southern Baltic-regions of Öland, Småland, Gotland and Blekinge and after reading a bit about regional variations, I'm going to wager that my great-great grandmother Delia was not taught this recipe by a person from Blekinge. Their dumplings are made partially using raw, grated potato; I've only ever eaten dumplings made of boiled, mashed potato. Alas, someone in my family was probably from Öland, Småland or Gotland - how's that for genealogy based on one dish? That said, these dumplings are filled with pork, smoked or salted, and in my family eaten with a white sauce, although they are also traditionally eaten with butter or lingonberries, too. Now, here's the thing, I've been vegetarian since I was a kid, so I haven't eaten Kroppkakor in 20 years. I made this vegetarian version for the first time pretty recently after making gnocchi. 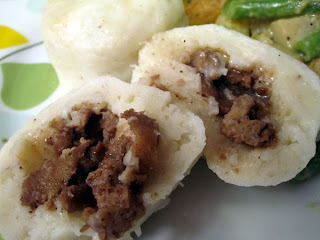 I used leftover gnocchi dough to form the dumplings, which worked really well. For a vegetarian version of the filling, sautee yellow onions with small chunks of seitan (although vegetarian bacon would work, too) and season this mixture with smoked salt and allspice*. I used this recipe as a guide, but this one works, too. And, introducing seitan Kroppkakor! Thor is either pleased or looking the other way, because I have yet to be smitten by a lightening bolt. And because, like Barry White, I think you can't have too much of a good thing, this morning I made Swedish pancakes. This is not something anyone in my family makes, but I had a jar of lingonberry jam from Ikea laying around. For these I used a Mark Bittman recipe, cranked up the Dungen and dug-in. Ett Gott Nytt År, everyone! * I don't know a lot about Swedish cuisine, but really love that allspice is used here and that nutmeg is what makes meatballs, Swedish. Ok. More November: I took the red-eye back from LA and thanks to my mom and aunt, slept though most of it. Yay?! to staying up all night drinking completely made-up cocktails with your giggly mom and aunt. That said, after sleeping for a few hours in my own bed, I was welcomed back to NY with bagels, a subway ride and romp around Riverside Park. On that one, here's to friends who make you get out of bed?! And here's Riverside Park. Riverside Church from Grant's Tomb. Grant's Tomb. Civil War dudes had enviable facial hair as shown here. Nick and I being Yankee fans. And with that, I'm a New Yorker again. Here I will attempt to start filling in the gaping hole that is November. Among other things, I spent Thanksgiving week in and around Los Angeles. The ultimate goal being to spend the holiday with family and to celebrate my Gramma's birthday, but I also snuck in a little sightseeing with old friends. In addition to my high school BF, I was able to spend some time with a good friend from Philly who now lives in Hollywood. Following lunch at The Grove, we wandered Hollywood Boulevard a bit, which was both fun and weird. I hadn't really been down there since high school and while it's cleaned-up nicely, I kind of missed the teenage runaways. The only freaks left seemed to be the celebrity look-alikes. We'd thought about hitting Melrose Avenue for old-time sake, but opted for pool side cocktails at the Roosevelt Hotel. Site of the first Academy Awards in 1929, the hotel also hosted celebrities like Clark Gable and Marilyn Monroe. The later's first magazine photo shoot took place at this very pool and more eerily, she's said to haunt the place. Oh, how I would have liked to have seen such a glamourous ghost. Ghastly... A couple of days later, we headed out to Santa Monica, because no trip to California is compete without seeing the Pacific. Following a surprisingly scream-worthy go at the Sea Dragon and Zoltar advising Aneek to live everyday as if it were her last, I made a new green friend - a 13 year-old parrot who proceeded to fall asleep on my shoulder. I'll post more LA photos to Flickr, but you get the idea. I ultimately had a huge Thanksgiving dinner with my grandparents, mom, aunt, uncle and cousins. I am grateful to have had the opportunity to spend time in a place that holds so many warm-and-fuzzies for me, with people I see way too infrequently. And with that, happy holidays, all. Here's to good food, family and friends.